There is no doubt that Ramadhan is both the most spiritually fulfilling and the loneliest time of the convert experience. Food and sleep deprivation, long nights of prayer, the awkwardness of meeting strangers when venturing to community events and the stress and anxiety of doing any or all of these alone: Ramadhan easily lends itself to being an emotional rollercoaster. For a female convert, this can be compounded when facing the unislamic mysoginy of our communities and places of worship. So as I hit a wall – or should I say partition – early in Ramadhan, I quickly re-evaluated my Ramadhan plans. I don’t doubt my Islam, but I do my involvement with “institutionalized” Islam: the mosques, the mussalahs, the associations, the organizations, and the overall community. It is not a lack of affection or respect for them, but rather self-love and the need for self-care that forces me to step back. Community requires energy that I don’t always have on my own. I turned to sisters in faith, in community and in interest, fellow Muslim feminist bloggers and friends: Umm Dean (Canadian Mooselim) and Eren (Identity Crisis by New Muslim(ah) Walking Around). Social media united our presence and, while I was away for over a year, I made a point of meeting both during separate visits to the National Capital Region. I have grown attached to Umm Dean’s lovely family, and Eren and I have bonded as unmarried 20-something converts and my experience of the partition brought both of them to offer their ears, hearts and shoulders to my cause. My situation was not unknown to them and they knew very well the emotional toll community can sometimes take on empathetic Muslimahs. They encouraged me to write to the imam and the mosque’s board of directors to voice my discontent. It turned out, I had not been the only community member to complain and accomodations were made so that the sisters who desired a partition were able to get their own segregated space that would not infringe on the rest of the community. During this period of loneliness, they each offered to meet with me to break the fast in solidarity, in kindness and in friendship. I proposed that we meet all three together – they had yet to meet “offline” and I was happy to facilitate this meeting between these two sisters whom I love and admire. Muslim kinship – sisterhood, brotherhood – is often referred to in community interactions: “brother”, “sister” (or the Arabic akhi, ukhti). However, too often are they used in patronizing ways, mitigating criticism or atenuating demands: “Sister, your hair is showing!”, “Brother, could you pass the tea?”. There are those times, however, few and far between, when a fellow beleiver registers in my books as a true kin of faith. Assisting and being present for me in times of need certainly put Eren and Umm Dean in that category. 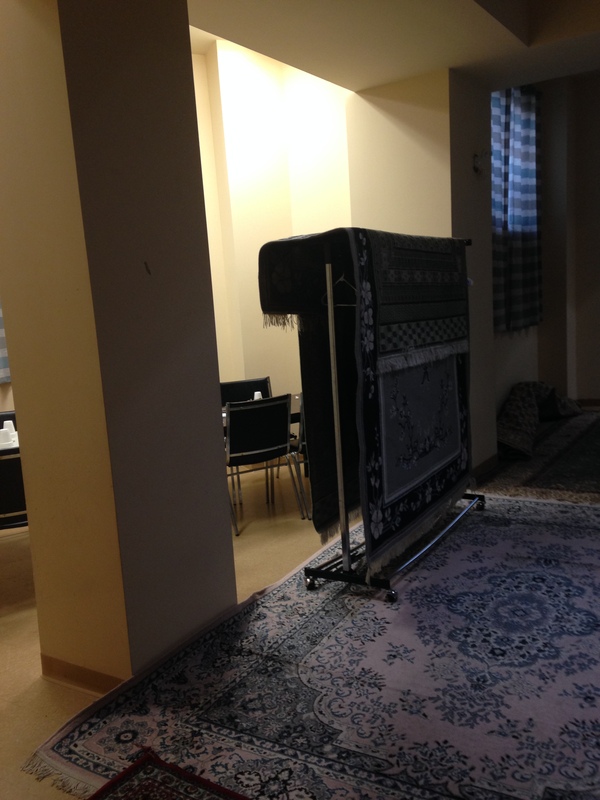 It was at iftaar, in the mosque basement, when we noticed the new “side” (rather than room-length) partition and sighed a communal sigh of relief, that I felt a weight lifting off our shoulders. We ate, talked and laughed, but – most importantly – we prayed. It was during the sunset prayer (Maghrib) that I felt reassured in my faith and in my practice: God always sends us beacons of light when we most need it. Side by side with my strong, awe-inspiring sisters, we worshiped The Creator, The Divine, The Master of All the Worlds, The Most Compassionate, The Entirely Merciful. Eren’s Identity Crisis by New Muslim(ah) Walking, Where the Undesirable Go. While we often use the appelations of kinship with fellow believers, Ramadhan reminded me what this kinship truly means in rights and responsibilities. We have been called upon as believers to help one another, to lift each other up. We are required charity (Sadaqah) and islamic charity covers any thing a believer might need, from money to a comforting smile. My sisters lent me their shoulders, to lean on, to cry on and to pray next to. I hope you were offered shoulders this Ramadhan, and I hope all of you will find the strength to be someone else’s shoulders in times of need. A blessed festival of the breaking fast, Eid ul-Fitr Mubarak!